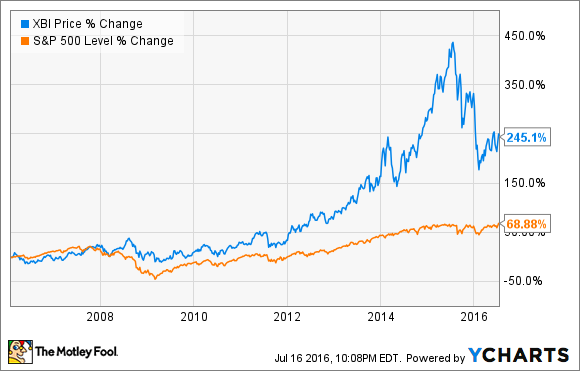 Here's why biotech stocks are great over the long run. Where should you invest? Every investor faces lots of choices. There's a solid case to be made that stocks should be a part of every portfolio. But what kinds of stocks? I'd argue that you won't find too many better options right now than investing in biotech stocks. Here are five reasons why. Look in the mirror. You're getting older -- and so is everyone else. The latest statistics showed that 14.5% of Americans are aged 65 and over. That figure will grow to 21.7% by 2040. By 2060, there will be twice as many older Americans as there were in 2014. It's not just the U.S. population that's aging, either. The United Nations projects that the proportion of the world population aged 60 and over will double by 2050. How do these demographic trends relate to investing in biotech stocks? As people age, they tend to use more prescription drugs. The bottom line is that demand will inevitably grow for prescription drugs in the future. That will translate to sales growth for both pharmaceutical and biotech companies. Smart investors will surf this demographic wave. Biotech companies enjoy a distinct advantage over pharmaceutical companies -- at least in the U.S. Thanks to Obamacare, biologics (a medicine made from a living organism or its products) receive marketing exclusivity protection for 12 years. Most drugs are only granted exclusivity for five years, although orphan drugs claim exclusivity for seven years. To understand how significant that exclusivity advantage is, consider AbbVie's (NYSE:ABBV) Humira. This biologic first won FDA approval to treat rheumatoid arthritis back in December 2002. AbbVie subsequently gained approval for other indications, including Crohn's disease, in 2007, psoriasis in 2008, and ulcerative colitis in 2012. If Humira was a non-biological drug, it would have lost exclusivity for all indications except ulcerative colitis by early 2013. In 2013 through 2015, Humira generated sales topping $37 billion. That's an extreme example of how important the added exclusivity period for biologics can be. Even without the regulatory protection, biotechs can breathe a little easier than their pharmaceutical company peers. The process of developing a biosimilar for an existing biologic is more challenging than developing a generic version of an existing non-biological drug. In part because of these challenges, there is still no biosimilar for Humira on the market, although rivals are knocking on the door. You can't just look at how well the stocks of an industry have performed in the past and assume that they will continue to enjoy the same levels of success in the future. However, it's a good idea to consider historical performance -- if the underlying factors that contributed to the performance can be realistically expected to continue. There's no question that biotech stocks as a whole have an outstanding track record of success. Here's how performance of the SPDR S&P Biotech ETF (NYSEMKT:XBI), which was launched in 2006, stacks up against the S&P 500 Index. What have been the drivers behind biotech stocks' success? Great products and high demand. AbbVie's Humira is a good example; Gilead Sciences' (NASDAQ:GILD) Sovaldi and Harvoni are two others. These two drugs cure hepatitis C and generated combined sales of more than $19 billion last year. We've already noted how demand should become even stronger as the U.S. and world populations age. That alone should help sustain the long-term strength of biotech stocks as a whole. But are more great products on the way? You bet -- and that leads us to reason No. 4 why biotech stocks are smart investments. If biotech companies didn't continue to innovate and merely rested on their laurels, investing in their stocks would be a dumb move. Of course, that's not what they're doing. Take Gilead Sciences, for example. Gilead could try to just milk Sovaldi and Harvoni for all their worth. Instead, the big biotech recently won approval for a new hep C drug, Epclusa, that's even better than its predecessors. Gilead has also used the cash it's generated from successful products like Sovaldi and Harvoni to invest for the future. In April, the company bought Nimbus Therapeutics' program targeting treatment of non-alcoholic steatohepatitis (NASH). There are currently no approved treatments for NASH. Some estimate the potential market size for new drugs for treating NASH to be upwards of $30 billion. It's not just big biotechs like Gilead with exciting pipelines, though. Consider Inovio Pharmaceuticals (NASDAQ:INO), which has a market cap of around $650 million. Inovio's lead product is VGX-3100, a cervical dysplasia vaccine. Analysts think the vaccine could generate peak annual sales of $500 million if approved. Inovio also has another pipeline candidate, INO-3112, waiting in the wings that combines VGX-3100 with a DNA-based immune activator. Success for VGX-3100 should bode well for INO-3112 as well. The biggest buzz for Inovio these days, however, has to do with its experimental Zika virus vaccine. Inovio became the first company to win FDA approval for human testing of a Zika virus vaccine in June. While it could be several years before any Zika vaccine becomes widely available, Inovio currently enjoys a lead position in the race. Granted, these are just two examples. A cursory glance at the pipelines of biotechs big and small, though, will show how much potential lies ahead. Despite the great opportunities for biotech stocks, they're actually pretty cheap right now as a group. The SPDR S&P Biotech ETF mentioned earlier, with holdings of 85 biotech stocks, is down 35% over the last 12 months. It should be noted, though, that this big pullback came on the heels of massive gains in the previous years. One of the primary reasons for the lower valuations of biotech stocks has been worries about political pressures on pricing. Former Secretary of State Hillary Clinton even targeted one company for alleged "predatory pricing". Clinton's healthcare plan promises specific actions to hold down drug and biologic prices. Should investors be wary of buying biotech stocks because of this? I don't think so. For one thing, there's no guarantee that Secretary Clinton will succeed in making drastic changes should she be elected President. Even more important, though, are the demographic trends and pipelines discussed earlier. Biotech stocks have been great investments for the last decade -- and I predict investors who buy biotech stocks now will reap excellent returns over the long run.